The Newport Beach Film Festival seeks enthusiastic film lovers to volunteer for Orange County’s annual celebration of cinema. The 19th Annual Newport Beach Film Festival, presented by Pacific Sales, runs April 26—May 3, 2018. 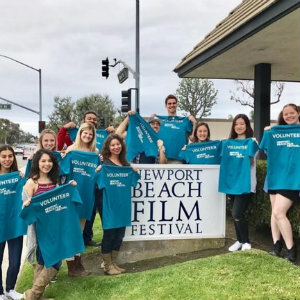 As a non-profit organization, the Newport Beach Film Festival wouldn’t be able to bring such an amazing event to life without the help of over 400 volunteers. Volunteers will have the opportunity to participate in several aspects of the festival. Volunteer positions include: Guest Relations, Merchandise Sales, Media Relations, Theater Ushering, Event Production and Office Reception. Before the festival, volunteers must attend at least one mandatory orientation meeting. The one-hour meeting provides an overview of festival activities, as well as updated information on positions and volunteer responsibilities. Volunteers will have the opportunity to ask questions and sign up for specific shifts at the meeting. In addition to the automatic volunteer discount on film tickets, the Festival Volunteer Appreciation Program has been revamped for 2018 to provide a more rewarding experience for all volunteers. Volunteers under 18 years old must submit a signed parental consent form. A parent/guardian must accompany volunteers, under the age of 16. Monday, 4/16 @ 6:30 p.m.
Wednesday, 4/18 @ 6:30 p.m.
Thursday, 4/19 @ 6:30 p.m.
Saturday, 4/21 @ 3 p.m.